Commercial Doors Sales, Service & Installation in Michigan. In order to ensure that your commercial doors in Michigan work well and are durable, it is always best to get them professionally installed. The benefits will outweigh the costs. As professionals we are able to custom fit the doors to the buildings and will give the best advice on what materials complement the building’s architectural style. We also understand the safety, fire and disability regulations and will ensure the doors are compliant. At Great Lakes Security Hardware we also offer guarantees on the doors installed which is an added advantage in case of any malfunction. There are different types of commercial doors found in Michigan. Commercial doors are used in commercial buildings such as office buildings, retail shops and stores, restaurants, hotels and in schools. In addition to making a building secure, doors also serve aesthetic purposes. They should make strong first impressions on customers or clients. When making a selection from the wide array of commercial doors certain factors need to be considered. You should consider the type of material to be used for the door. Commercial doors withstand more use and movement than residential doors so the material chosen should be durable. These doors are usually made of wood, fiber glass, glass, aluminum or steel. Each material has its own benefits and drawbacks. The amount of traffic the door will handle on a daily basis and its placement play a role in selecting the door type. For instance, the type of door chosen for a bank will not be the same as that for a restaurant or retail store. In the restaurant, the front door and the back door serve distinct purposes and will have to be different. One should also take into consideration the design of the building, the quality and stability of the materials used and the overall cost of the door and its installation. 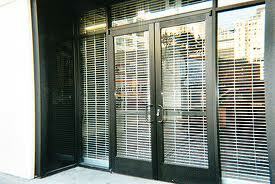 The following are the different types of commercial doors in Michigan that we offer. There are automatic or revolving commercial doors which are highly useful in retail stores or anywhere people need to carry or push items through the doors. They are easy to open and come fitted with motion sensors which automatically open the doors when a person approaches. These doors are also handy for use by people who have disabilities. The other types of commercial doors are revolving doors which consist of two revolving door panes set perpendicularly to each other and divided into four quarters. These are useful in areas with high people traffic as they provide entrance and exit at the same time. They are energy efficient in that they protect against the elements. Impact commercial doors are also available and are designed to swing inwards, outwards or both ways. They are suitable for indoor use in places like restaurant kitchens where there is high traffic and hygiene is maintained because people do not touch door knobs continuously. For buildings where there is constant loading and delivery of goods, overhead doors are ideal. These doors are typically made of aluminum or steel and are fitted on a panel which slides upwards giving access to the building. Using us at Great Lakes Security Hardware to get your commercial doors in Michigan installed will ensure the whole process is timely, efficient and hassle-free. Call us today 888.855.6257 or fill in the form on the right for a consultation on getting your commercial doors.